At least three Somali security officers were killed when suicide attackers detonated an explosives-laden vehicle at a security checkpoint near Mogadishu’s international airport several hundred meters from the main base of an African Union peacekeeping mission. The checkpoint is also close to United Nations offices and the Peace Hotel, which are frequently visited by foreigners and officials. Homegrown extremist group al-Shabab, an Al-Qaeda-linked militant group, claims to have carried out the attack, Reuters reports. According to police officer Mohamed Ahmed, one assailant first drove a car into a checkpoint outside the headquarters of the African Union peacekeeping force AMISOM, killing three Somali officers stationed there. “Civilian buildings were damaged,” AMISOM said on Twitter. At abt midday today, two loud explosions were heard outside the MIA area in #Mogadishu. Investigations r ongoing. More information 2 follow. Police captain Mohamed Hussein told AP that the bomb was detonated as security forces were busy searching cars at the checkpoint. Ahmed told Reuters that the death toll was likely to rise because the bomb was powerful and caused damage to nearby residential buildings. 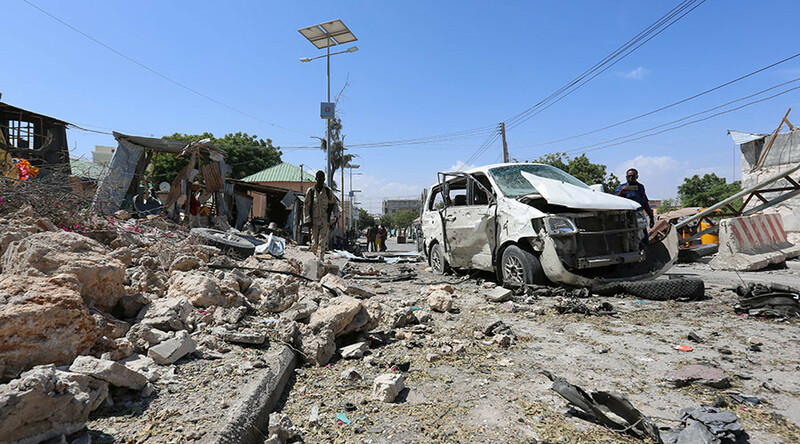 Mogadishu has seen a number of bomb attacks at hotels and military checkpoints, with the homegrown extremist group al-Shabab, an Al-Qaeda-linked militant group, claiming responsibility. At least 29 people were killed and dozens more injured in Mogadishu in December when a suicide blast went off near the entrance to a busy port. Al-Shabaab claimed responsibility for that attack, according to Reuters. In August, some 14 people were killed in two separate suicide attacks in the Somali capital – one on the presidential palace and another at a restaurant. In January of 2015, 20 people died when militants attacked the Mogadishu’s Beach View Cafe by setting off a car bomb before conducting an armed assault, as is Al-Shabaab’s usual tactic.